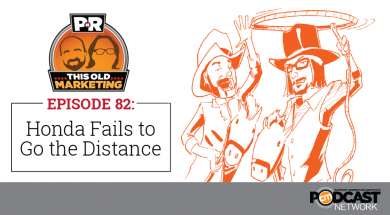 In this week’s episode, Robert and I ponder how Facebook’s dominance in online advertising is likely to grow with the debut of Instant Articles, and take issue with one author’s glowing prediction that it will become the “Pangaea of publishing.” We also consider the News Reader Apple announced this week and how it will compete against Facebook. Honda shows us what happens when an organization launches a good idea, but then doesn’t support it, and pulls the plug too early. Finally, we discuss how The Onion handles sponsored content while maintaining its satirical brand voice. This week’s raves include a brilliant 12-year-old who launched a media empire, a creative job listing, and a book that contains excellent advice for marketers who want to be better storytellers. We wrap up the show with a #ThisOldMarketing example of the week from How To Cook That. Facebook’s deal with publishers (3:50): As publishers contemplate the risks and rewards presented by Facebook’s Instant Articles platform, new data from Pew Research reveals just how dominant the social media channel already is in digital display ads. According to this report, 28% of all digital ad revenue is already going to Facebook, and that number is likely to increase as Instant Articles matures. Robert explains why this move by Facebook may be a good short-term move for brands, but cautions it may not be as attractive in the long run. A Facebook love story (5:03): This article is paired with one from Seeking Alpha, which predicts that Facebook’s new Instant Articles platform is likely to transform content creation and marketing and will become the “Pangaea of publishing.” Robert and I agree that this article is nothing more than a thinly veiled love letter to Facebook, not a balanced portrayal of its pros and cons. Apple’s News app announcement (10:55): At its Worldwide Developers Conference on Monday, Apple announced News, its new, free news reader that will allow publishers to integrate their stories directly into a native iOS app. Robert and I agree it should be a worthy competitor to Facebook Instant Articles; that, in turn, should keep advertising prices affordable for brands. I predict an acquisition that would give Apple a stronger position in the news-reader market. Honda holds off on being a media company (16:55): Last year, Honda looked to make a big splash by announcing that it was redirecting its budget for cable TV advertising into developing its own digital destination – the Honda Stage website and YouTube channel. But users didn’t flock to the site or the channel the way Honda had hoped, reports The Wall Street Journal. My visit to the website reveals several major issues that may have contributed to its less-than-stellar performance; Robert believes it was a worthwhile experiment that could be iterated into a more successful venture if the automaker were more patient. The Onion handles sponsored content (26:06): The Onion is enjoying growing revenue from developing sponsored content for brands, according to AdAge. But as you would expect, its take on these ads is predictably satirical, making fun of the idea of sponsored content to entertain and engage readers. But sponsored content is serious business for The Onion, where more than 90% of its ad deals include a custom component. Robert and I admire how The Onion has creatively extended its distinctive editorial voice into sponsored ads. Publishers and e-commerce (31:27): As newsstand and advertising revenues plummet, magazine companies are desperately seeking new streams of revenue to plug the holes, reports WWD. E-commerce has emerged as one promising solution, but critics say publishers are biting off more than they can chew. I disagree; publishers can be successful in e-commerce if they cultivate the right skill sets. NET-A-PORTER Group and its Porter magazine prove that it’s possible to provide a seamless experience between editorial and product sales. This Old Marketing is sponsored by Citrix GoToWebinar, a do-it-yourself event tool that projects your message to up to 1,000 online attendees. 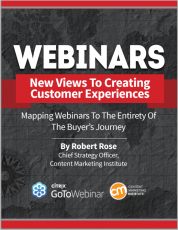 It’s offering a new report written by Robert Rose entitled The Role of Webinars in the Buyer’s Journey. It explains how webinars can be used in a variety of roles throughout the buyer’s journey, best practices for approaching content by purpose, and why you should broaden the scope of webinar use to increase the success of your content marketing strategy. Learn more at http://gotowebinar.com/CMI. Joe’s rave: Business Insider has published a profile of Emerson Spartz, who built his first website when he was 12, and has parlayed that 16 years later into a very successful online media empire. In the process, he has become an expert on using analytics and principles of human behavior to predict which pieces of content will go viral. I’m impressed with his keen sense of how to create influence and impact at such a young age. Robert’s rave: Robert loves this TweetMyJobs listing for a Chocolate Ambassador at the Ghirardelli Marketplace in San Francisco. The job of this person is to “delight and educate customers” – exactly what we talk about doing with storytelling in content marketing. Robert’s rave: Robert recently finished reading Daring Greatly: How the Courage to Be Vulnerable Transforms the Way We Live, Love, Parent, and Lead by Brené Brown. It contains a lot of wonderful advice on leading and living. Its lessons can help us create more engaging, authentic stories that our audiences will love. For more on Brown’s work, view her TED Talk about the power of vulnerability, which has been viewed over 20 million times. How To Cook That: One of the biggest challenges for marketers and entrepreneurs is how to create a content tilt – a unique, engaging perspective that differentiates it and builds a strong audience. Ann Reardon from Sydney, Australia has accomplished that and then some with her How To Cook That website. She launched it in 2011, to keep herself occupied while doing night feedings of her newborn son. She taught herself how to build a website and to shoot and edit high-quality video. Her unique content angle? 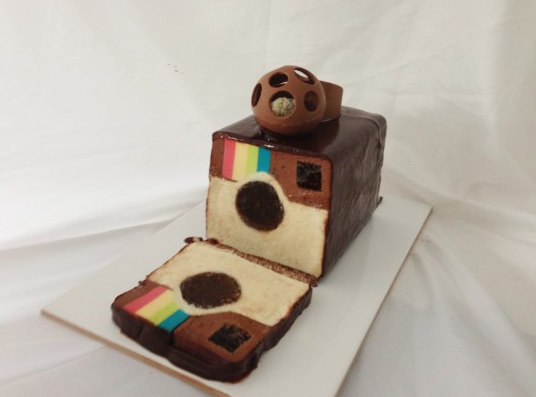 Creating seemingly impossible creations, such as baking a cake out of 5 pounds of Snickers bars or creating one that is a perfect representation of the Instagram logo when you cut it open. Three years later, her YouTube channel has over 1 million subscribers and gets over 16 million views a week. She and her husband have monetized How To Cook That in multiple ways, including sponsored content and a paid Surprise Cakes app. It’s an excellent example of #ThisOldMarketing.